Price: $10 (Lulu) and $15 (Amazon). Please note that the prices are often discounted by the online distributors. 147 MILLION ORPHANS (MMXI – MML) is the first book-length haybun poetry collection. A haybun is a combination of hay(na)ku and prose. 147 million is an often-used estimate for the number of orphans worldwide. The book also features a dozen guest poets also writing in the same form and theme (William Allegrezza, Tom Beckett, John Bloomberg-Rissman, Michael Caylo-Baradi, Patrick James Dunagan, Thomas Fink, j/j hastain, Aileen Ibardaloza, Ava Koohbor, Michael Leong, Sheila Murphy and Jean Vengua). a very fine portfolio of haybun … the results are dazzling. The book amounts to a powerful (and polyvocal) meditation on orphanhood, adoption, parenthood, education, the poetics of language acquisition, and multiple authorship. It’s both lyrically intense and structurally adventurous. … depths are also found in a variety of other contemporary writers who have been led to question the aesthetic approach. Eileen R. Tabios’ work with materials from her adopted son Michael’s school studies makes brilliant use of re-framings that keep the context shifting and meanings slipping. The integration of her work “Orphaned Algebra” with pieces spinning off from it by j/j hastain goes even further. My early review of this work attempts to detail some of that. Tabios’ subsequent 147 Million Orphans (MMXI-MML) also invites other writers to engage with this material and the haybun form. The variety of angles achieved this way serves to open contexts and readings even as each haybun unfolds a haiku of words taken from Michael’s studies. It is simply elegant. Eileen Tabios continues to challenge the borders of poetic communication while all the while touching us deeply with her ability to create honest caring and love. Highly recommended collection of poetry, of thoughts, of insight. In the years that I have been reading and reviewing Tabios’ work, I have been continually awed and propelled in my own work by her commitment to the writer’s role as social voice, conveying both unique media and social justice messages that resonate with the reader in a compelling dance that requires and inspires action. Like the work of a gifted playwright or screenwriter, the truth here is clear: if the reader’s relationship with the words ends when the book is closed, there is something lacking—like fruit that is not eaten, like seeds that are not planted [and watered and cultivated], it becomes Momentary; a Fragment without Function. The politics of Diaspora, of the life of the orphan, of the empty rhetoric and nefarious policies of multinational corporations and educational systems that fall far short of their potential to produce independent and critical thinkers, all converge in the genesis of the source material [the vocabulary words] into Art and Authentication. But there is always counterpoint, yin and yang, light in dark: “Many adoptive parents feel: I didn’t save a child. A child saved me” [pg. 23]. I humbly count myself among those parents. “‘exploit’ can also mean abuse misuse” [pg. 47]. A peek behind the patterns of the process. An invocation of Mark Twain’s “The difference between the right word and the wrong word is the difference between the lightning and the lightning bug.” But is there more than one “right word”? Abuse and misuse evoke completely separate meanings. One normally disappears, but here it still remains, to work upon the reader’s mind, ripe with layered nuance. Think about it. Write about it. Set out to authenticate or eradicate it as a notion, an idea. Let it be both at one and the same time. That is the value of Tabios’ approach to poetry. It is collaborative. Its Authority gives it room to be pushed, pulled, reinvented. The book closes with “A Quintet for Michael Gerard Tyson,” offering insight into the enigmatic (and, as I learned here, orphaned) former heavyweight champ, whose antics and actions outside the ring engulfed and all but obliterated his achievements within it. I encourage you to read 147 Million Orphans as poetry, as parental testament, as social commentary, as thought experiment, and most importantly, as the starting point for your own [continuing] engagement with Word and Idea. when the boy whose intellect dwarfed his body started hurling rocks through the dim windows of the orphanage, he was not defining “knucklehead.” If a vessel with its hidden hole loses its base, how to contain, hold, embrace… anything in flux like liquids or emotions or identity or the degradation of the word “consequence” into “punishment”? How to trust in the passage of time to offer the possibility of possibilities? That adoption commences a progression will not dilute the pain of how each new word must be gained through bodily cutting as if to live a bad poem’s dictum: to feel is to hurt. How to trust that a metaphor need not be a lie? What a knothole–this interior of a fist! This classroom of negative space…! It strikes me that the hay(na)ku portion reads almost clinically, i.e., the opening tercet seems fragmented and marked by a linguistic economy that is neither lovely nor unlovely. Each word, however, invites expansion. The imagery in the appended prose strongly captures some of the struggles a child contends with in the transition from orphan to adoptee. The excerpted text above references Mentwabe Dawit, biological mother of Angelina Jolie’s daughter Zahara. The haybun implicitly tackles the politics and dynamics of adoption, particularly transnational adoption where poverty has made it impracticable for a mother to raise her child. This is a book that offers up some powerful thought-provoking messages. It deserves to be heard because it speaks out against social injustice and brings to light the shocking plight of those who have no voice of their own. 147 MILLION ORPHANS was launched at the fabulous community library, The Sitting Room, founded by Virginia Woolf scholar J.J. Wilson. More information about the BOOK LAUNCH is HERE. 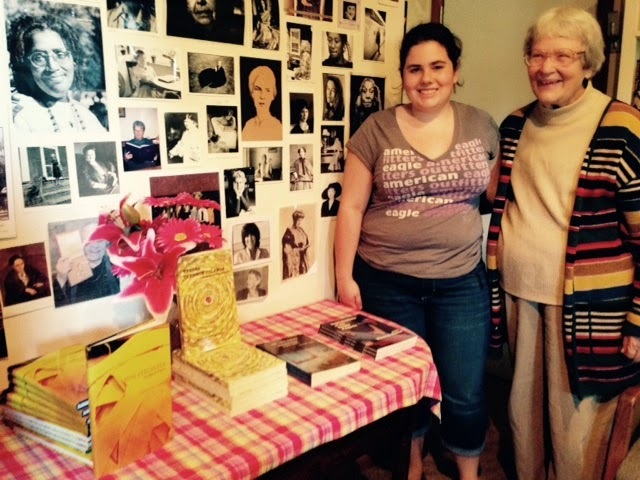 Sonoma State University student Erin and The Sitting Room founder J.J. Wilson at the book table.